Despite the biting winter wind she wasn’t allowed a cup of tea mid-shift. Besides, she explained, if she did drink a brew she would only need a wee and that was a big no-no and wasn’t allowed by her boss. She had to stand for four hours without moving, holding a sign with her gloveless, cold shaking hands, an arrow pointing to the nearest Cash for Gold shop. It wasn’t exactly her idea of an ideal job but she had to do it. How else was she to pay for the kids’ Christmas presents? We chatted for a while and she spoke of how she managed to keep the children’s expectations of Christmas lower by explaining to them the real meaning of Christmas, not all the commercial bling and tat and plastic crud. I smiled; thankful that I had met someone who, like me, knew the reason for the season. I nodded in agreement waiting for her to finish her sentence. Wide-mouthed and lost for words I stood under the Cash for Gold sign contemplating her understanding of a Christmas that celebrated Santa’s birthday.“What about the nativity?” I finally perked up from my shocked state. I gently explained about the birth of Jesus and the gift of him for her and her family too. She hadn’t thought about Christmas like that before. This short conversation woke me up once more to the fact that most people around me simply just don’t ‘get’ what Christmas has to do with Christ. I must admit that I love it when people ‘get it’ and when mad creative ideas actually work and spark off people’s imagination as it dawns on them that this good news of Jesus is, well, flipping good! So, here’s my top 10 ways to reach people in your community with the story of Christ’s birth, they don’t include events or carol singing as I think the church as a whole has got this down to a fine art. So, instead of the ‘come and hear’ kind of things churches can do, here is a list of 10 ‘go and tell’ kind of activities. One of the easiest and fun filled projects you could ever do! This is a project I started in 2008 which has now been used by hundreds of Churches in the UK. It enables all kinds of people to be involved in the Christmas story by encouraging them to participate and experience being part of the nativity in a fun way. After setting up a nativity scene in their local town, churches invite people from their local community to dress up and be part of the scene. There are two places I love to get my nativity story booklets from: Bridge builders and Life Words. There simply isn’t another time of year when people are willing to take and read a booklet about the life of Jesus. Some parents have commented to me how they would like to read to their children about the life of Jesus as they feel they haven’t learnt the ‘true meaning’ of Christmas. How about running a film night in your local school/ shopping centre or village hall showing The Nativity as a means of giving the story away? It’s a beautiful adaptation of the Christmas story and one that will spark conversations. Paint some oval shaped pebbles as a baby sleeping and lay on a bed of straw in different places around your community, on doorsteps or benches, bus stops or pub tables… hide the baby Jesus for people to find! This is something that everyone can take part with. Also, don’t be put off by the painting aspect, it really is as simple as 1,2,3. 1. Using white acrylic paint, paint an oval shape on one side of the stone. Let it dry. 2. Using a brown or pink acrylic paint, paint a roundish smaller shape for the face of Jesus. let it dry. 3.Using a permanent black marker draw around the face and body. Draw 4 lines for the swaddling clothes. Add the eyes, smiley mouth and one curl for the hair. Have fun! The idea came from British artist Mark Wallinger. The Guardian newspaper reported his attempt of a commission for Leicester square. I wrote and asked Mark Wallinger if I may use his idea. He didn’t reply, so I took that as a yes! It is a fun art installation to do. Full of anticipation and incarnation, a baby born right here in our midst. Some of the most deep heart-felt conversations have been down pubs while I have been dressed up as a shepherd or angel! I usually carry gifts and combine some of the ideas already shared, but the most effective is offering beer mats. It’s a boy! Don’t forget to whet the baby’s head this Christmas. 7. Give out some feathers, or other symbols! Really. The message brought by the angels resonates with people. Buy a load of feathers and attach the ‘announcement’ of good news from the angels. When I have done this I have been amazed as to how many people want to talk about angels and finding feathers. A beautiful opportunity to talk about God’s presence and reality in their lives. It really is quite amazing how many people find feathers in weird places. I heard a story once of a lady who in a time of heart ache and bereaving the loss of her child found feathers everywhere, including one in the fridge placed on top of a chocolate bar. I love how the Angels announced: do not be afraid. They brought good news and as I have given out feathers in the pub and on the streets I have also retold the good news of the one born for all people. When I first gave out feathers last year I was amazed as to how such a simple gift brought joy to people. As I put them together down the pub some of the locals came over and asked about them… Some asked if they could take one for a friend too. It really couldn’t be easier. Ask people to sign a birthday card for a friend. 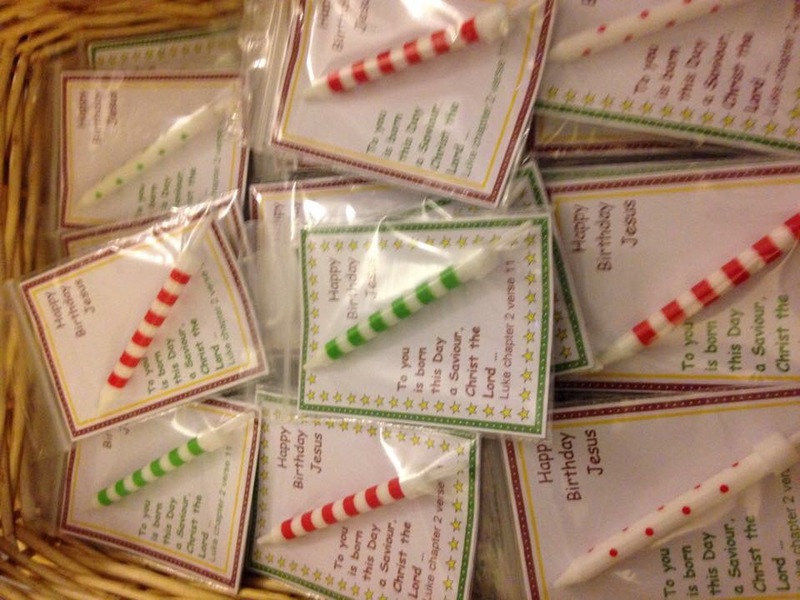 Other ideas around this theme that a friend of mine did included giving out birthday candles with a simple message. The card idea I used down the pub and one card I left in a plinth in the streets. A live nativity complete with donkey brings the old story close to people, and children love to pet a donkey gather round and take pictures. Nearly 20 years ago I did my first live nativity through the streets of Chester complete with Mary riding a donkey. It was a powerful roving nativity and people literally stopped in their tracks. Last year as a small team in Peterborough we wanted to give away gifts and to publicize this we dressed up one of the team as a star. He wasn’t too happy about it, but it certainly got people’s attention. I know this may seem like a cop out, a ruse to make a list of 10 rather than 9, but using what you have is simply the best gift you can give to let others in on the Christmas story. If you paint, then paint. If you sing then reverse busk (give away things instead of receiving donations.) If you dance then dance in your high-street! If you’ve got money, give it away to those who have none. If you rap or wrap, then get rapping or wrapping. If you have time use, serve, love and bless others who would be lonely this Christmas. whatever you’ve got, use it for the sake of those who have yet to connect with the Christmas story. One year The Light Project made a stall on a busy shopping street with free teas and coffee and got a load of wrapping paper to wrap up people’s gifts. This generated lots of conversations! How about sharing your ideas of what you do below or contact me with your stories for others to also use your creative ideas in their communities. Oh Chris, I laughed and laughed when I scrolled down and saw the pictures of you and your volunteers in security jackets. Fantastic! Don’t know if Pitlochry is ready for me in an illuminate jacket, but, looking to try some of the other ideas for Christmas out. Thanks for being up for all this wonderful madness. Thanks David- Lovely to hear from you! This is great a fantastic way for christians/Church to show/tell the Amazing Christmas story thank you all so much. Have passed this on to our leadership team. I love these ideas – might try the stones around our 4 villages this year – includes a pub/ chip shop and community shop! Hi Chris, really interested in the Pub Mat idea. Already holding a monthly ‘service’ in a pub. Would be great to have some mats for Christmas. Ok, I shall let you know when they are ready! Hey up! I didn’t get the grant I had hoped so I am doing one design and small print run. They will cost £25 per 100 beer matts which makes them 25p each. This includes posting them to you. They won’t be ready until the 4th December which gives two weekends to use them before Christmas. It’s a baby boy! Don’t forget to wet the baby’s head this Christmas. Better spell “wet” rather than “whet” on the beer mats. “Whet” implies a knife… Otherwise a lovely idea. What about a pic on the beer mats? Thanks Rosemary. I shall get the beer mats made soon! Okie dokie! I shall get them made and sorted asap! Hi Chris I would be very keen to buy some beer mats – great to have a baby pic on them – this goes down really well especially with hearts softened by a few pints! Chris, I will be sharing this with our house groups together evening tomorrow, thank you!! Chris, love this! I’m interested in the beer mats please! Thanks buddy! I will let you know when the beer mats are here! Thanks Crystal… hopefully you got my email, if not please can you email me your address and I shall send as soon as possible. HI, great ideas could you also let me know when the beer mats are ready. Hi Chris how are the beer mats coming along and is there any idea of the cost? Hey Esther- I shall find out ASAP! Hi Esther- I didn’t get the grant that I had hoped so I am making a small batch- £25 per 100 beer matts. Steep I know. If you’re interested I can get them to you for 4th December. Hi Chris, Are you doing the beer mats gain this year 🙂 If so would love to have some. Great inspiration and food for thought….I wonder what we’ll end up doing in Clayton. Any advice on how to approach neighbours with a view to just getting together to read the Bible…like Big Hearted lyfe? Oops! Clayton not Clacton! Doh! So sorry for the delay… I shall know by tomorrow for sure! Hey everyone. I didn’t get the grant I had hoped this year to do beer matts so I’m doing a smaller print run at £25 per 100 beer matts. Can you email me if you would like to order some? chris.duffett@lightproject.org.uk Thanks! Here’s more info just in case! Thank you for sharing these ideas! My husband and I are starting a church (more like missionaries) in Portland, Oregon. These are the kinds of ministry tools we use. We even have an inflatable T-Rex (follow@trexpdx on Instagram!) that goes around our neighborhood and gives out cards for free coffee. People can follow and find out where he will be and get their coffee. Anyway, thank you for sharing like-minded ideas! We are in a spiritually very dark place where the enemy thinks he has won. Many people moved here specifically to get away from church and religion (of course, i’d argue those things often get in the way of Jesus). Do you meet much resistance with these activities? What is your typical response to that? What will you be doing this year? Thank you for your encouragement. We rarely encounter people who object to what we do as if people don’t want to know we’re cool with that! Most people ask us questions and encounter something that they can’t ‘put their finger on’ and want to know what it is they are experiencing. Blessings upon you with what you’re doing in Origen. The kingdom is growing! Here in Macclesfield we have being doing the Christmas Wrap in the local Grosvenor Centre for 11 years. This year the alterations have prevented us doing it. We are praying God will open a door for us to continue. 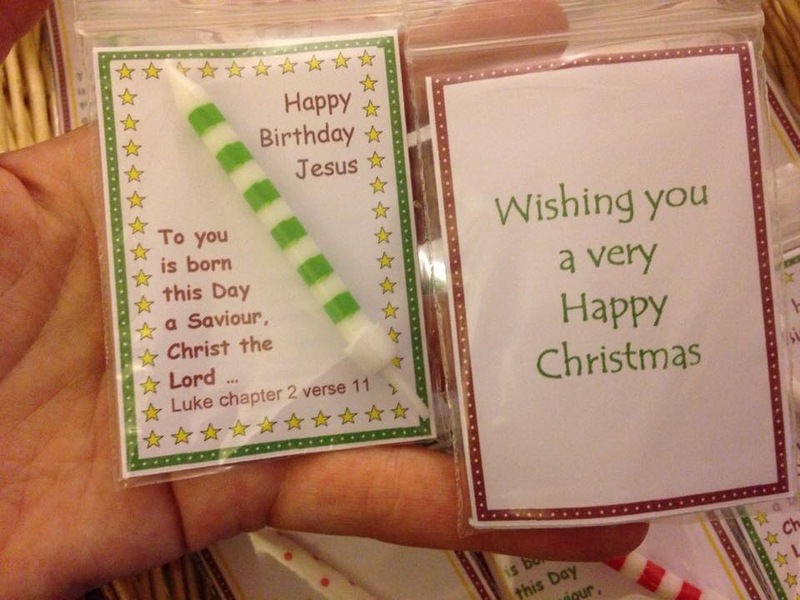 We always hand out a leaflet with ‘Why Christmas’ on one side and all the Church names & contacts on the other. We also have a ‘Prayer Tree’ we ask folk if they have any prayer requests, it’s amazing how many people suddenly share the things that are on their hearts. The prayer is written down, hung on the tree & taken to the Church for people to pray. Folk look forward to seeing us year after year. Especially those with arthritis & their fingers and hands that don’t work properly. Or others that are dashing with a Secret Santa gift that needs wrapping up. God gives us lots of wonderful surprises as we stand there wrapping gifts. May the Lord bless all you are doing for Him. Where would we be without Him…. ? Great question! I know I would be in a right ole’ mess without Jesus. Bless you and thank you for your encouragement.